Is Time for Major Engine Repair? There's a lack of performance, poor acceleration and your fuel economy has hit the ocean floor. After many, many miles your car's engine may be on its last legs. But you love your vehicle and don't want to get rid of it, so what can you do Well there is always the option to rebuild or replace the engine if the motor's operation can't be restored with simple repairs. If you run into any of the following issues it may indicate it's time for some major engine repair or possibly an engine rebuild or replacement. If your engine sounds like bricks in a washing machine as you drive down the road you're definitely in for some sort of engine repair. The engine's moving parts rest on engine bearings and if they become worn out due to high mileage or poor lubrication they will begin to make the loud knocking noise. More often than not this issue will require rebuilding the bottom end of the engine. When the oil is changed be sure the old oil is inspected for metal shavings. This is a clear indication that unwanted metal on metal contact is happening between the moving parts inside the engine. This means there is poor lubrication and the friction that is occurring is causing engine parts to wear down very quickly. This is likely happening due to an oil leak of some sort, which may be inside the engine and burning the oil or leaking out onto the ground. Excessive amounts of smoke coming out of your tailpipe can indicate major engine problems. Blue smoke means your engine is burning oil, preventing proper lubrication and potentially starving your engine of oil. Black smoke means high amounts of gasoline are being burnt. This can cause engine problems due to extreme heat created by the gasoline's ignition as well as drop your fuel economy drastically. White smoke can indicate the burning of coolant, meaning there is a leak in your cooling system putting your vehicle at risk of overheating, which in turn may cause extensive engine damage. If your vehicle just doesn't have the get up and go that it use to be sure to bring it to an auto repair mechanic that can diagnose the issue and provide you with options for repairing the problem. Whether the decision comes to a rebuilt or replacement engine or with any luck, just a simple repair, it is important to have the work done promptly to avoid a break down. If you need engine repair in Palo Alto or Mountain View talk to the team at The Car Doctor. 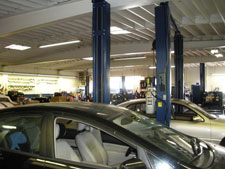 We utilize state of the art diagnostics to ensure fast and accurate auto repairs. To learn more or to schedule superior auto repair in Palo Alto give our team a call at (650) 492-6853 at your earliest convenience. Why does my vehicle need oil changes every 3,000 miles? Is Your Car Up to Date with These Auto Maintenance Services? Is it Time for Drive Belt Replacement? What is Cooling System Service? What Triggers the Check Engine Light? Why Does My Car Need Scheduled Auto Maintenance? What is a Fluid Flush? Does this mean I need brake repair? How do I know if I Need Suspension Repair? How Important is Tire Pressure? Does my car need new tires? Here's how to tell! How can an Auto Repair Shop become a NAPA AutoCare Center? What Causes a Car Battery to Die? Hard Starting: Does my car need a new starter motor? Does my Car need an Engine Rebuild? Why do Vehicles have so Many Computers? What Does Colored Exhaust Smoke Mean? Why Does My Car Smell Funny? Why is My Car Loud? How Important are Regular Oil Changes? Call (650) 492-6853 Today for an Appointment!